With over 40,000 food items lining store shelves the decision as to which ones to purchase can often be overwhelming. The Caltons erase consumer confusion in this indispensable grocery store guide. Welcome to RICH FOOD, POOR FOOD – Your personal GPS or Grocery Purchasing System. In their first book, NAKED CALORIES, the Caltons revealed the importance of choosing the most micronutrient RICH FOODs. Now they make these foods even easier to identify, making sure you leave the checkout with a cart full of health enhancing essential vitamins and minerals. This indispensable grocery store guide takes you aisle by aisle, from the produce section to the pasta aisle, visiting every department in between, teaching you how to identify potentially problematic ingredients including hormones, pesticides and GMOs, as well as sharing tips on how to lock in a food's nutritional value during preservation and preparation. Regardless of age, dietary preference or current health, RICH FOOD, POOR FOOD turns the grocery store and farmers market into a micronutrient pharmacy—filling your shopping cart or reusable Limited Edition RICH FOOD, POOR FOOD Shopping Tote with a natural prescription for better health and longevity. Wondering what foods to bring home for your family? The RICH FOOD, POOR FOOD – GPS has been programmed to steer your cart towards fresh, local, organic foods that are RICH in essential micronutrients. But, the RICH FOOD, POOR FOOD – GPS is also programmed to avoid foods containing over 150 different POOR FOOD ingredients. Some, like sugar and high fructose corn syrup you may have heard of, but others, like disodium EDTA, benzoates and BVO you may still be unaware of. In RICH FOOD, POOR FOOD we help guide your cart through every aisle of the grocery store, from produce to poultry and drinks to desserts, to identify these hidden dangers, so that you don't mistakenly put them on your family's plates. SAVE YOU MONEY! Choosing quality foods can cost a little more because they utilize wholesome, expensive ingredients in lieu of cheap health-depleting ones. But, your RICH FOOD, POOR FOOD – GPS not only rewards your health, it rewards your checkbook too. Our Make Cents tips offer cash conserving suggestions to help you lower the tolls on your highway to health. MAKE YOU THINK! Food For Thought offers fun facts that really give you something to think about and help bring to life the truth about the safety, nutrition, and nature of food products. RICH FOOD, POOR FOOD supplies information for the most inquisitive of minds. OFFER YOU COUPONS! When you see this symbol next to a product's name, there is a money saving coupon waiting for you. Our collection of Coupon Clippers can save you hundreds of dollars on some of the healthiest foods in the grocery store. KEEP YOU SAFE! Micronutrient depleters, toxic carcinogens, and sugar substitutes, Oh My! Sometimes the road to finding a RICH FOOD is fraught with health-violating villains. When this happens your GPS suggests a No Taste Like Home solution, sending you home with a do-it-yourself solution. DELIVER QUALITY FOODS! Sometimes the supermarket is lacking in optimal options. On these occasions we will find you an Alternate Route to Health, and direct you out of the grocery store to a new location where RICH FOOD can be found. RICH FOOD, POOR FOOD is unique in the grocery store guide arena because rather than rating a particular food using calories, sodium, or fat as the main criteria, it identifies the products that contain wholesome, micronutrient-rich ingredients that health-conscious shoppers are looking for. Put the pedal to the metal and get in the fast lane because it couldn't get any easier than this. This GPS is programmed to direct you to hundreds of our fantastic Rich Food choices that have won our seal of approval. We've named names and programmed the GPS with the products that satisfy our Rich Food rules. 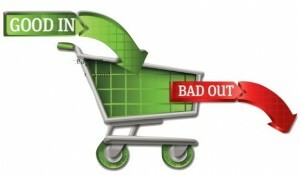 Put your hands behind your back and step away from the shopping cart! The foods that make this list are in serious violation of the Rich Food rules. 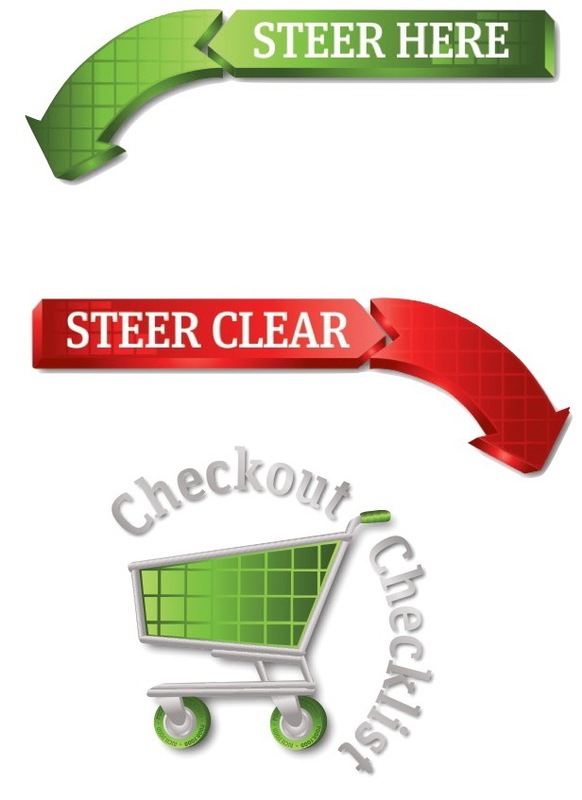 We supply a Checkout Checklist for every aisle, which clearly outlines our Rich Food rules for you to follow. Regardless of where you are shopping, following the Checkout Checklist will make for a successful grocery shopping experience.